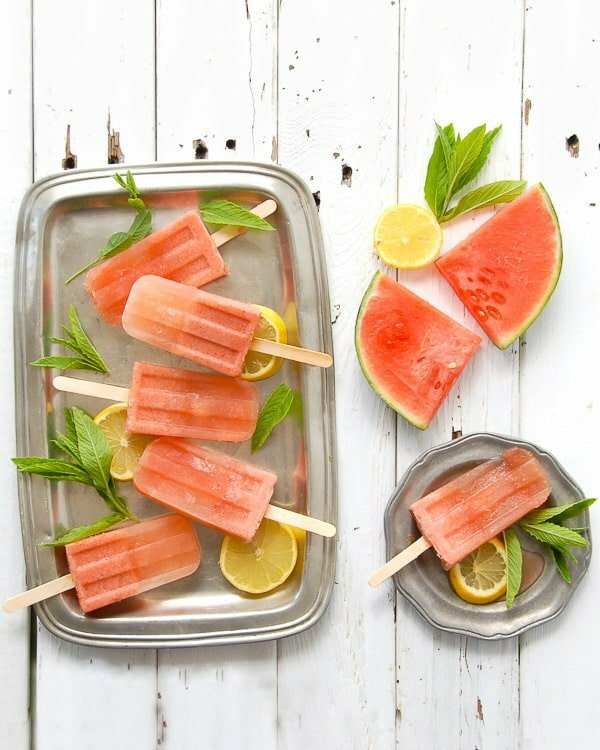 Cocktail hour is forever changed with these heat-quenching Costa Rican Watermelon Mojito Popsicles. 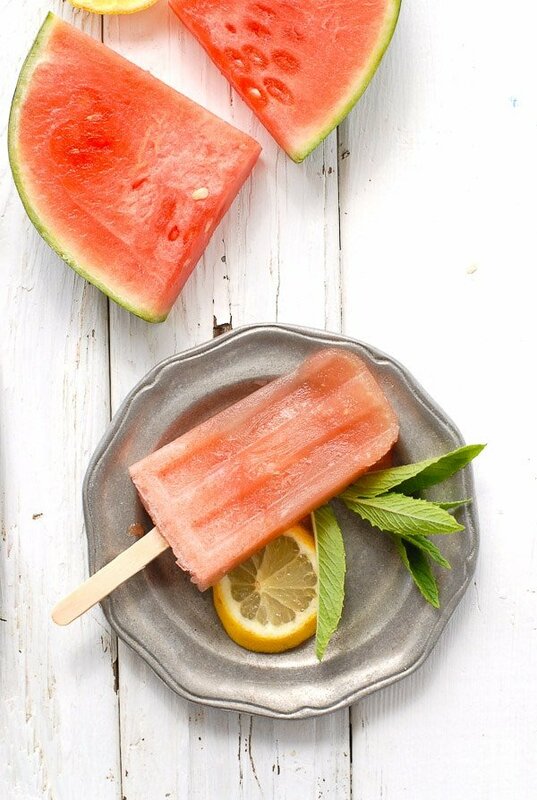 Watermelon, mint and a bit of rum, take the edge of summer’s heat with a refreshing poptail! I’ve always thought an interesting career would be to be a Social Anthropologist. I’m fascinated about the trends of the collective consciousness. Why out of the blue every TV network might feature medical or law programs, for instance. Why there is a current fixation with reality showcased in bizarre and intrusive exposes on TV and the internet. What shifted the public eating to a more down-to-earth sensibility (though that to me is an easier thing to explain)? Why a certain food leaps to being in vogue, either from nowhere or being circulated from the past into the now. I am currently obsessed with popsicles. Making them. Eating them. I’m not sure what opened the popsicle flood gates exactly but it’s on like Donkey Kong for me. I have not loved popsicles forever but they are in my forefront now, and I know I’m not alone. I have two popsicle molds and have been seeking a very specific, third type that has a vintage feel. I was recently in a local hardware store that has everything, looking for this popsicle mold. I ran into a couple doing the same. They stood over my shoulder and evaluated the molds at this store in hushed tones which I overheard to reflect all the disappointments I had experienced on my hunt. We began to trade tips on numerous stores that had failed us, brick-and-mortar and online, sharing a camaraderie of the popsicle mold hunt. Go figure. Fortunately I was able to find the popsicle mold online (the wooden popsicle sticks too) and I’m thrilled to use them today. 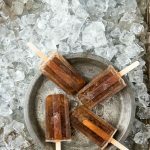 When my popsicle switch was flipped I instantly had ideas for about 5 different recipes that I’m trying my hardest to pace rather than startling readers into feeling they’ve popped in not on Boulder Locavore but to ‘Popsicles are Us’. 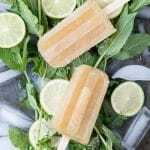 After making Mango-Kiwi Limeade Paletas I really wanted to try a cocktail popsicle. A two summers ago we traveled to Costa Rica and dove headlong into everything local; the food and libations garnering equal attention to the fascinating rain forest landscape. Our hotel served some gorgeous cocktails including a Basil Mojitos which became a fast favorite. Another delight were Watermelon Mojitos which they’d make fresh poolside, pushing a stocked cart around those sunning lazily, muddling fresh cocktails on demand; like table side Caesar salad but with booze. I felt the Watermelon Mojitos was destined to be my first liquor pop. Instead of muddling I blended everything leaving a bright taste of mint and watermelon. The color was a sublime pink and the flavor refreshing and fun. 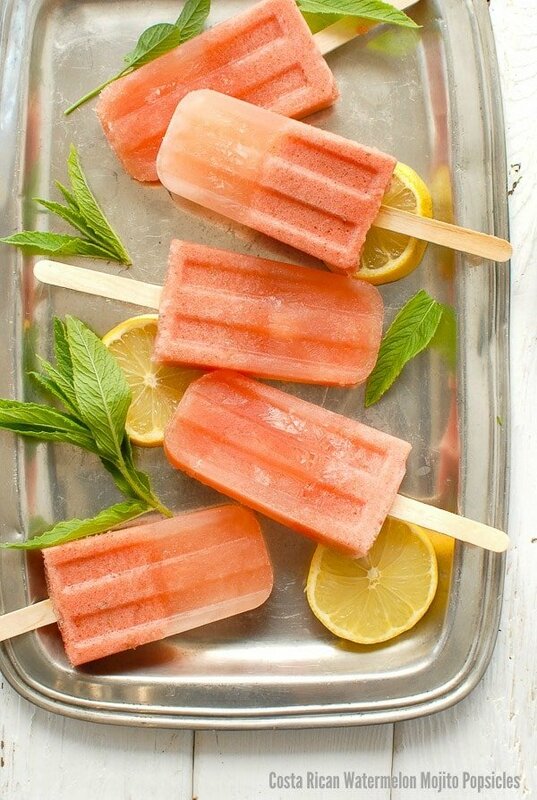 I think eating one’s cocktail is a trend that deserves more exploration and Costa Rican Watermelon Mojito Popsicles are a perfect place to start! Popsicles are not just for kids. And these pops are definitely for adults only! 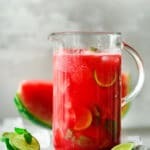 If you’ve tried this Costa Rican Watermelon Mojito Popsicle recipe or any other recipe on BoulderLocavore.com please don’t forget to RATE THE RECIPE and let me know where you found it in the comments below, I love hearing from you! Blend all ingredients on high until fully incorporated. 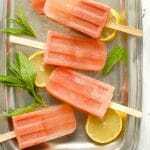 Pour into popsicle molds; cover and insert wooden sticks. Tip: applying a layer of foil over the top of the mold or lid of the mold allows placement of wooden sticks and they will not float out of the mold. Could I use lime instead of lemon? I have never had a mojito with lemon before! 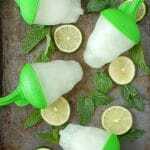 Or is it better with lemon?? For a wedding in September! Thanks so much! I’ve only made them as written since they are based on a specific mojito recipe. My suggestion would be to make two taste test batches since you have time; one with lemon and one with lime and see which you like better. Hi how long do you think these would last in the freezer? I would like to make them for my wedding but would need 100+ so would need to make them ahead of the date. How long they will last and how long they will last and look wedding-ready are probably different! I would probably not make them any more than a week beforehand and would keep them tightly wrapped in the freezer. Because alcohol freezes differently they will melt more quickly and not freeze as hard as non-alcohol popsicles which makes it more difficult to store when removed from the mold to keep them in pristine shape. I don’t have experience storing them long term but with other alcohol popsicles I’ve made they are don’t look as nice once removed from the mold and stored in the freezer. You could always make a test batch, remove them from the mold and test store them however you would for your wedding to see how they hold up. Congratulations and best of luck! Another name for adult popsicles is “poptails” 😉 Lots of recipes on the internet for them…yours sounds wonderful! We are having a BBQ this weekend, and these Popsicles look like they are definitely in order 🙂 Such a gorgeous color too! They would be perfect! I too love the color but the flavor is so bright and fresh; that’s what I am over the moon about! Those Popsicles look amazing! Have to try them! Hi Pola! I’m eating one as I write and agree you must! These look so good. But I may not freeze them. That way I can slurp them faster! 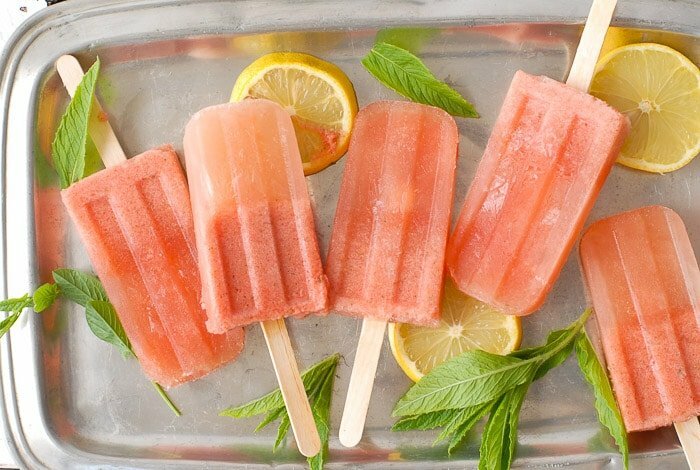 The recipe left a bit extra so you can make the popsicles and have a splash yourself! If you want to make the actual cocktail there is a link in the post for it too! Looks so good to be enjoying the hot summer days with. I’d especially love to try pineapple or strawberry flavors. I used to love popsicles as a kid, but not so much as an adult. But these seem more appealing to the adult palate. Looks so tasty! I am with you on having left popsicles in my youth….til now! The flavor possibilities are endless too. Sounds like you need to start experimenting yourself! These looks delicious.. Love the photos.. That pewter plate is gorgeous!!! Thank you! I love the platter too! And that its a bit banged up from living a life. So, just out of curiosity, where did you end up buying your nifty molds? I’ve been looking for some that are more ‘basic’ too. Those look perfect. It seemed like such a classic design (they were what the couple I mentioned was looking for as well) it was funny I had such a hard time finding them I thought. 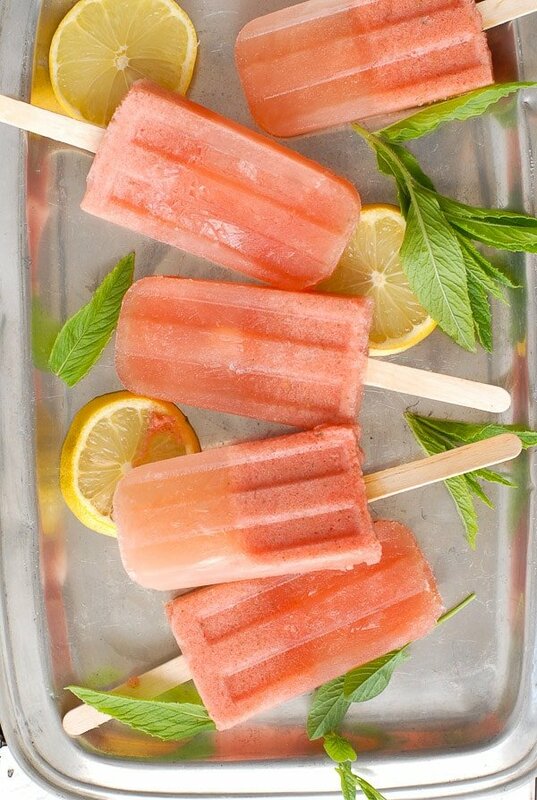 So glad you liked the recipe; I think you’ll like the popsicles even more! o.m.g…. I cannot wait for hot weather! We always throw a big bash 4th of July… I think I’m going to have to make several batches of these for the grown ups! What a fun idea! Now if only it would warm up here! Our weather has been odd too Jennifer. Was warm and now it’s cooled to 60 or so with rain. Suppose that’s good for the drought but not so summery! You will love these whenever you decide to make them! Yum! I’m into popsicles lately too. These are a definite must make…soon!!! I find as much as I love ice cream, popsicles are more refreshing in the summer. These are completely delicious; light, flavorful and of course with rum! Cocktail Popsicle, that’s quite brilliant Toni. A Popsicle I wouldn’t be able to stop enjoying, I would finish them all. I am mesmerized by your first picture, such an inspiration and so well taken and styled. Thank you for sharing! Thank you Helene! I have a batch of these in the freezer now and have to remind myself I can’t eat them at will but rather need to plan as one would for Cocktail Hour! Definitely a fun alternative! It’s addictive Eric! As I said I’m not sure what flipped the switch for me but I’m on that bandwagon now myself!